Shake Shack is popping up at Eleven Madison Park’s Winter House in Aspen, too. What’s better than cozying up inside your own personal yurt with a tray of cheeseburgers, loaded truffle gravy fries, and spiked hot chocolate? The obvious answer: Nothing. On Thursday, January 24, Shake Shack will travel to Aspen and pop up inside the seasonal EMP Winter House, in partnership with American Express, at the St. Regis. 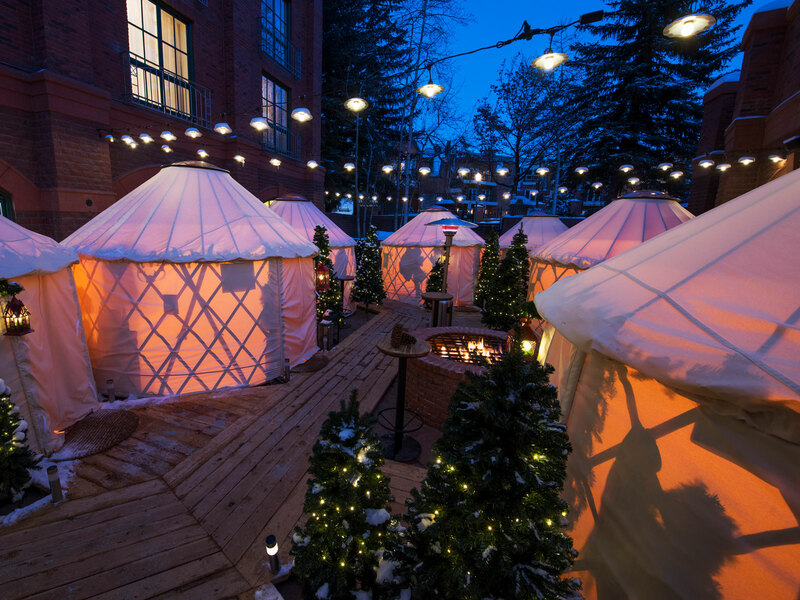 For three days, the burger chain will serve a special collaboration menu inside EMP’s yurt village, a collection of Swiss-themed heated tents set up in the exterior courtyard of the hotel. If you can't book a last-minute trip to Colordo, don’t worry: the winter-inspired Shack menu will also be popping up at the chain’s original location in Madison Square Park. As for the yurts, they’ll make an appearance, too. Launching the same day as Aspen’s Shack, NYC will set up a handful of comfy (and heated) tents for customers to eat in and enjoy their own makeshift version of après ski vibes. Otherwise, it’s important to note the menus at each location differ slightly. Both include the Alpine Swiss Burger, topped with applewood-smoked bacon and Jasper Hill alpine-style cheese sauce; Truffle Gravy Fries, drizzled with even more alpine-style cheese sauce (top it with black truffle for an added cost); and the Swiss-Style Hot Chocolate Shack, made with a dark chocolate blend with honey, almond, hazelnut, and finished with a marshmallow. At EMPWH, the menu also includes the Chicken Schnitzel Sandwich, a traditional Shack Burger, Spiked Hot Chocolate or Spice Cider, and wine. Eleven Madison Park opened the doors to EMP Winter House December 15 in Aspen, taking up residence in the St. Regis’ Chefs Club with a menu inspired by chef Daniel Humm’s childhood in Switzerland. Compared to the New York City institution, EMP Winter House is a more casual outpost, and similar conceptually to EMP’s Summer House in the Hamptons. EMPWH will remain open through April 9, 2019. Shake Shack at Madison Square Park’s winter-themed menu will run from Thursday, January 24 through Sunday, January 27 from 11 a.m. to 11 p.m. EMPWH’s Shake Shack will run until Saturday, January 26 from noon to 4 p.m. daily. American Express is the only credit card accepted at EMP Winter House.